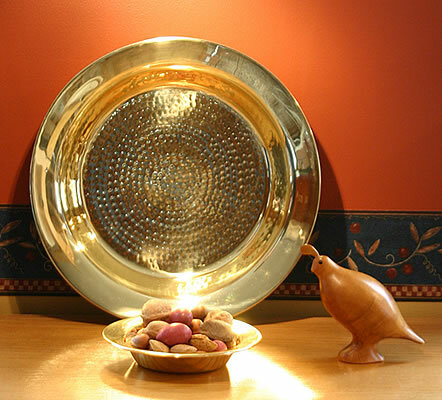 Brass Bowl shown here when filled with greenery and a pillar candle to create a stunning centerpiece. This beautiful hand finished 13-3/4 inch round bowl weighs in at almost three pounds! At just over two inches deep it will hold a lot of fruit, nuts or whatever you want to put in it. Or you may want to just display it empty, it is that beautiful! Also available in 10 inch and 7 inch sizes if you need something a bit less capacious. The brass is lacquered to keep it shining.